Cucumbers are thriving in the fields and our CSA members have been receiving an abundance of them for the past few weeks. 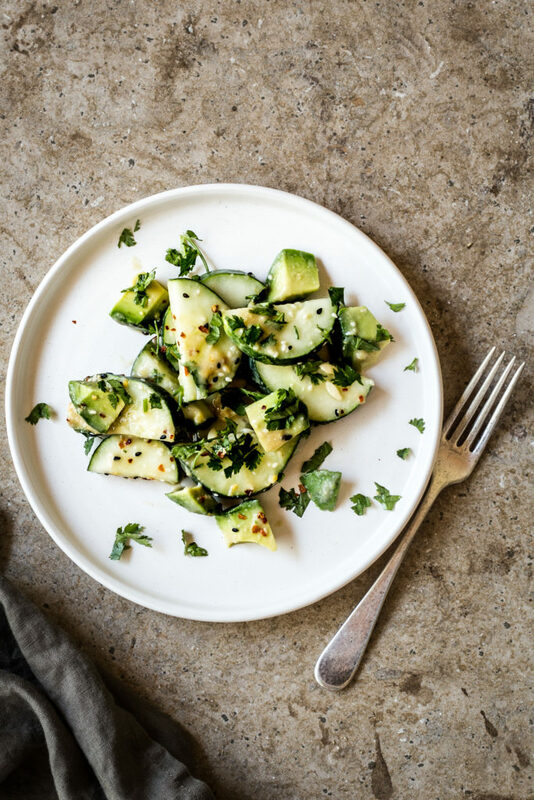 I love cucumbers and find that they’re an easy vegetable to add to pretty much any summer dish. I’ll add sliced cucumbers to my glass of water throughout the day and particularly enjoy snacking on them with a pinch of flakey sea salt and fresh lime juice. However, when we’re expecting company at the farm this is the way I want to showcase this seasonal delight. Bright, crunchy, and bursting with fresh flavors this is what summer salads are all about! With the addition of avocado and plenty of cilantro this is the kind of salad I’ll turn to for the rest of the season. Serve with grilled chicken, fish or even tofu for a complete and healthy weeknight dinner. In a small dry skillet over medium heat toast the sesame seeds until golden brown. About 2-3 minutes. Shake the pan a few times while toasting. In a large bowl combine the toasted sesame seeds, miso, tahini, vinegar, sesame oil, honey, hot water and crushed red pepper flakes. Stir well. Add the cucumbers, avocado and cilantro. Toss well. Serve immediately.